Wednesday saw me attending the Bibendum Grand Tasting, an annual wine tasting event held at the Saatchi Gallery in Chelsea, widely considered to be ‘the’ wine event of the year. I’d booked the day off work especially, it’s an all day thing – the doors open at 9-30am and close again at 7pm and I planned on making the most of it. Those who know me, probably realise I’m not much of a ‘taster’, classing myself as more of a ‘drinker’….the idea of spitting fantastic booze away after just a brief taste fills myself and my particular compadre – “the liver”, with utter horror. To this end I thought it would be an extremely good idea to eat a hearty breakfast first. Something to soak up that booze and save me from the worst effects of all the self inflicted excess. 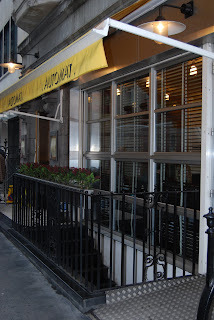 I’ve always fancied eating at Automat in Mayfair, the American diner. 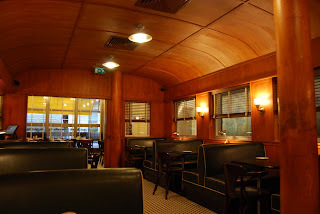 I hear it mentioned on and off pretty regularly, and I remember seeing pictures of the gorgeous interior when it opened. Checking their website, I noted that they open for breakfast from 7am and that their menu is pretty extensive – covering all of the classic American breakfast options pancakes, waffles, French toast etc. Lovely. I booked a table for myself, and a couple of other food bloggers attending the wine tasting. So far - so good. The night before threw up an interesting dilemma. For various reasons, my dining companions had to drop out one by one. Until I was left with a stark choice, cancel the table…. or dine alone. Dining alone is not something I’ve ever done really, at least not in the sense of booking a table at a restaurant, turning up and being seated – ordering and eating alone. It’s entirely new to me, and if I’m honest the idea filled me with some trepidation. But, a quick poll on Twitter found that many of my fellow foodies often dine alone in restaurants, in fact some stated that they really enjoy the chance to eat, people watch, read the papers or a novel and relax. This information left me brimming with newly found confidence; I decided to press on, cross this mental boundary and experience solo dining. I was going. Strolling through St James Park, on a grey drizzly morning and clutching a paper to read with my breakfast I made my way up to Dover Street feeling fairly serene, in fact I was really looking forward to it, my jitters of the previous evening completely forgotten. 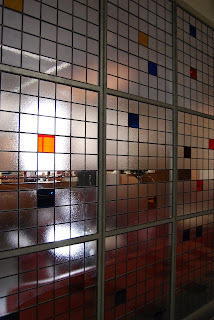 Spying the yellow awning of Automat, I entered – was greeted warmly and shown to a fantastic table…. a booth to myself in fact, which allowed me to view most of the restaurant which was fairly busy with well-heeled diners enjoying their breakfasts (This is Mayfair after all). A note about the interior….it’s bloody gorgeous! All wood, dark leather booths, chrome, black and white geometric tiles…a fantastic and very atmospheric study in how to get it right, I loved it. This combined with the Glenn Miller big band style music playing softly in the background made it feel like I’d stepped into a 1940’s detective novel. Perfect. Sipping a rather decent coffee, I studied the menu. Bearing in mind what I had planned for later with regards to pickling myself at the Bibendum tasting…the choice wasn’t actually that hard. “Automat Big Breakfast” strained out from the page, as the rest of the menu lost focus entirely. Made up of sausage, egg, bacon, mushrooms, tomato and topped off with fillet steak (that’s right – steak! and U.S.D.A. premium non hormone treated Nebraskan corn fed beef at that), it was practically ordering itself. All I had to add was my choice of egg (scrambled) and how I wanted my steak (Medium-rare) and we were good to go. Whilst waiting, I people watched, read the paper…updated twitter….I didn’t once feel uncomfortable dining solo, in fact it felt quite liberating in some way…..resisting the urge to explore this newfound and strange dining freedom further by stripping naked, my breakfast arrived just in time. Wow. Now that’s what I call a breakfast. 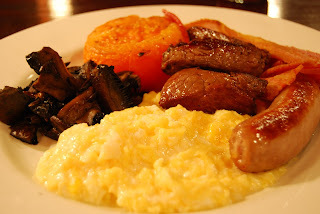 A heap of beautifully moist scrambled eggs, a huge tomato cooked just so until it was soft, but not mushy. Crisp bacon, a nicely browned sausage, a pile of mushrooms and finally the Fillet Steak. Cutting into the steak, spot on medium rare as ordered, I proceeded to demolish the breakfast in pretty short order. 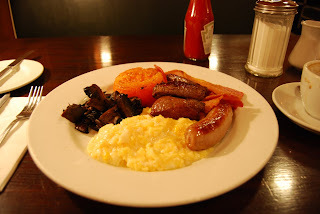 The sausage, the bacon and the steak were all of beautiful quality – as you would expect for a breakfast that costs £15 I guess. I absolutely loved it, clearing the plate, sighing happily and loosening the belt a notch or two…. I slumped back in the booth utterly stuffed and considered the verdict. I can easily say this was without a doubt one of the best breakfasts I’ve ever eaten, anywhere. Perfect, but combined with the beautiful interior and the feeling that your in a film noir detective flick. Priceless. I can’t recommend Automat enough. At these prices it’s certainly not an everyday choice, but as a treat now and again. Definitely. But the real test… How did this breakfast prepare me for a full day of ‘tasting’? I got to Bibendum at 12…and left at 7pm. I ate nothing else all day. I drank enough alcohol to send the late Olly Reed running for cover – and I felt fine, bit tipsy perhaps but totally A1. Automat – (and Bibendum wine) I salute you both. 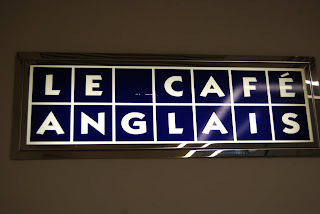 Le Cafe Anglais has been on my restaurant hit-list for quite some time. Mention the barest hint of it on twitter and you can't move for tripping over people raving about it, in particular the Parmesan custard with anchovy toast dish or the rotisserie cooked label anglais chickens. 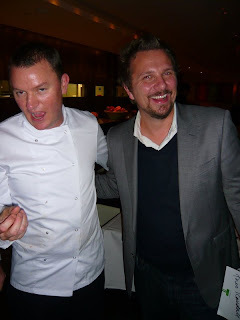 In addition the chef, Rowley Leigh is also something of a legend within foodie circles. I'd taken this all in, watched and waited.......and, just before Christmas with my incredibly ill-timed birthday fast approaching, when the GF asked where I wanted to go, her treat.....lunch at Le Cafe Anglais was my response. 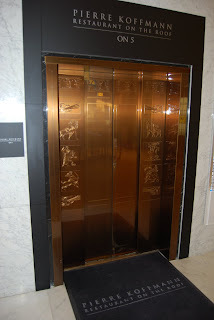 Making our way to the upper level in Bayswater's rather lovely Whiteley's shopping center, where "LCA" is located, and entering the restaurant for the first time...I couldn't help but be instantly charmed with the fabulous Art Deco interior. It's a favourite period of mine when it comes to interior-design and LCA is without a doubt drop dead gorgeous. It's grand, sweeping, high ceilinged, beautifully light and airy with huge windows lining one side of the dining room. It's a looker and almost impossible to believe that this space once hosted a McDonalds. Taking our seats and admiring the bustling and packed restaurant, we studied the menu - which is interesting as the Hors D'Oeuvres section is unusual and has been much discussed among food bloggers. 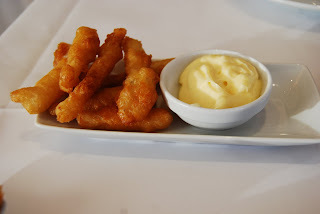 Deciding to order a selection, we went for a now famous Parmesan custard and Anchovy toast each, some Salsify fritters and on the waiters recommendation, oyster fritters which came with a Thai dipping sauce. Our order came quickly, our table quickly filling with small plates... But I really only had eyes for the Parmesan custard and anchovy toast...I've heard it talked about so often, and couldn't wait to try it. 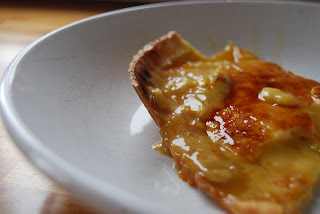 Dipping a toast into the rich Parmesan custard and taking a bite....well, there's much talk about the savoury taste 'umami' - this dish has it in spades. Rich, seriously cheesy and seriously fishy, It's unusual that's for sure, but it works and it's very moreish. The salsify fritters on the other hand, to me at least were pretty tasteless, despite the batter being lovely and crisp, the proffered mayonnaise seemingly overwhelming any flavour they had completely. 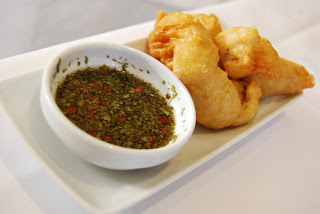 The Oyster Fritters were much more successful, the same beautifully crisp batter surrounding a meaty oyster, with the thai dipping sauce pungent with lemongrass working well. I liked these a lot. Onto the Mains, and I decided to order Partridge Choucroute, with Franks, Ventreche and Morteau. 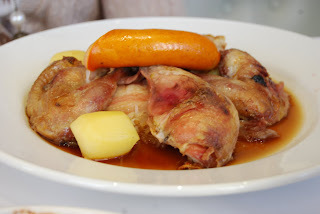 (Save you Googling it - I had to.....'Ventreche' being French unsmoked Bacon, and 'Morteau' - a type of smoked sausage from the Morteau region of France). 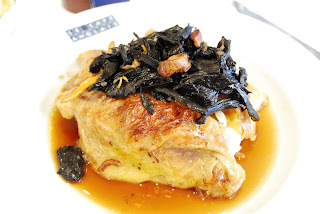 The GF went for Chicken Leg from the rotisserie, which came with wild mushrooms and a side order of Gratin Dauphinois. To Drink, on the sommeliers advice we ordered a bottle of Austrian Nittnaus Pinot Noir 2004 Burgenland, Chicken and Partridge being somewhat challenging to match within one bottle. It was pretty nice, easily drinkable - I liked it and it did seem to go extremely well with the dishes we ordered. My Partridge arrived, and straight away I must confess to being something of a game novice. It's the first time I've eaten Partridge...and If I'm honest, I didn't dislike it....but I didn't like it that much either. The plate of food was heavy, the partridge quite dry... It was OK, but I felt like I'd made a bad choice from the menu, especially eyeing some of the dishes waiters were floating past to other tables. I hold my hands up, I have no comparison to make, as it's not something I've eaten before....it could have been the best Partridge this side of Europe...but it just didn't do it for me I'm afraid. The GF's plate of Chicken and Mushroom was more successful, and incredibly cheap - chicken legs being one of the tastier but less appreciated parts of the bird. Although once again, I got the distinct impression from the GF that she wished she'd chosen a bit more wisely. Plates whisked away, and the GF declining a dessert - I went for a 'Queen of Puddings' - a very traditional British lemon and raspberry flavoured jam dessert topped with meringue. All I can say about this is, it was gorgeous. No complaints at all. Paying up and leaving the beautiful Le Cafe Anglais dining room behind, I thought about the meal I'd just ate. 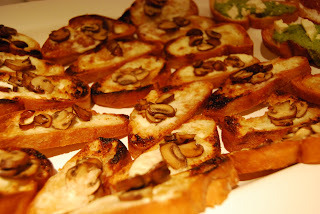 The Hors D'Oeuvres were fantastic, the Parmesan custard - anchovy toast dish in particular living upto its star billing. The mains - not so great. But I think the lack of main course enjoyment had a lot more to do with bad menu decisions on mine and the GF's part, than badly executed food. The Dessert I had, as previously mentioned - lovely. I would like to go back and try again.....give LCA another go. It certainly is a beautiful restaurant and a real experience. It's just feels like a personal disappointment as I was so looking forward to this and I wanted to love it. But, on this occasion, sadly my main just didn't work out for me. Next time hopefully, I will be a bit more fortuitous with my menu selection! "So, I'll be writing about eating and drinking in Leigh-on-Sea and London, the restaurants I go to, the bars I drink in (and pour myself back out of!) The food I cook at home, the triumphs, the disasters and the food poisoning - basically, whatever interests me (and hopefully you.)". I think I've fulfilled that statement of intent pretty well I guess. There hasn't been so much about Leigh-on-Sea (The Blog is fairly Londoncentric - but I try) or the drinking (its a given), but there's been no food poisoning....thank God. Yes, I'm pretty happy with the way things have gone. This past year, I've met some fantastic people, from all walks of life, luckily even a few who I now consider to have become firm friends. I've attended some incredible events, I've eaten excellent and unusual food, drank amazing booze....and I've learnt loads...... it's been a real adventure that's for sure. I can honestly say, it's changed my life. Toughy, but it's going to have to be the Coco book launch - an incredible evening, three excellent restaurants in one night and meeting the chefs as well! hard to beat. A close second would be the Paul A Young chocolate tasting - fascinating, eye opening and Paul is hilarious....oh and his chocolates are bloody amazing. I ate out a lot in the past year, in so many good places, but it's going to have to be Pierre Koffmann on the roof of Selfridges. 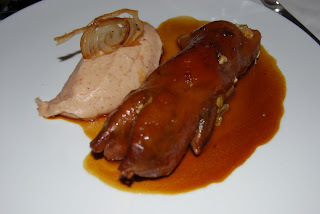 There was such a buzz about it, and it was such a magical night....I'll never forget it, or look at a Pigs Trotter in quite the same way again. Other memorable meals were the always excellent Tayyabs (a few visits in the past year), Great Queen Street, Hawksmoor for the incredible burger, The Ginger Pig and Chilli Pickle in Brighton (Thanks Fran)....the whole "Coco experience" of Maze, Theo Randall and Launceston Place in one evening and the Fitzwalter Arms in Kent for such an excellent overall English countryside vibe. I cook A LOT. 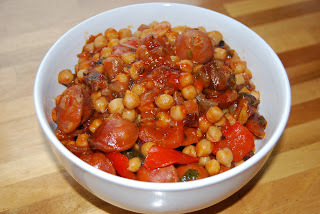 Every night in fact, and the best thing I cooked at home in 2009 without a doubt, is something that's quick, simple, hearty and cheap.....has to be the Brindisa Chickpea and Chorizo stew. I seriously love it with some rice and a dash of white pepper. I've probably cooked it more than any other dish this year. Runner up on the 'one off' front has to be the Moroccan leg of Lamb spiced with the Ras-el-Hanout that I brought back from Marrakesh. Couple of contenders here....I've tried to block them out, but I seem to remember making a particularly awful courgette based Gordon Ramsay recipe which was seriously disgusting. 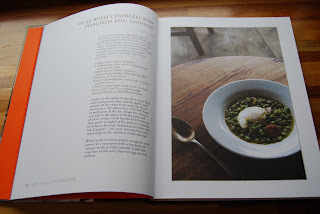 I also cooked a Moro pilav recipe with broad beans, which just didn't work either.....but the grand daddy of all worst dishes of 2009 was the infamous Orange-Lemon tart......(Another Ramsay I'm looking at you moment).....abject dinner party disaster....it just didn't set at all. I still seethe about it. 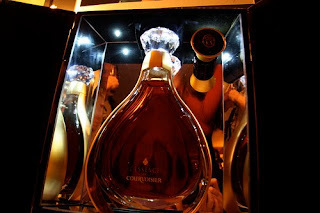 Without a doubt, had to be a snifter of the £2000 a bottle Courvoisier L'essence Cognac at the Towards a Fluid State event. Nothing else to add....I love Cognac.....it was lovely. Oh, just remembered the dessert wine at Launceston place Jurancon ‘Syphonie de Novembre’ Domaine Cauhape 2004 was seriously good as well. Overall the standard was pretty high, I rarely came across anything that was THAT bad....but one dish lives with me from last year as the worst I've ever encountered in a restaurant ever.....it was a local place *cough*SS9*cough* and it was "Pork Belly"......except this pork belly was a rubberised, dildoesque lump of gristle with zero crackling and zero nutritional value.... it was like chewing on a strip of fat.... I wouldn't have fed it to a dog. Without a doubt the most rubbish thing I've seen come out of a kitchen ever. I didn't blog it at the time, but I've never been back. 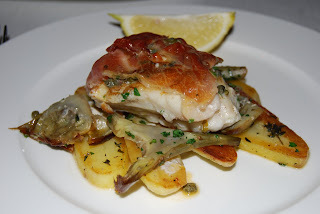 But has to be the 'Monkfish with prosciutto, artichokes, capers, parsley and Charlotte potatoes'. at Theo Randall. It was bloody delicious, so simple, but the ingredients...... so, so nice. 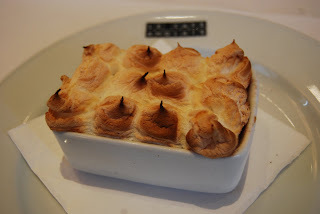 Other dishes I also really enjoyed, The famous Hawksmoor Burger, and an unusual dessert of peanut butter parfait, with marshmallow and praline at the Ginger Pig in Brighton. 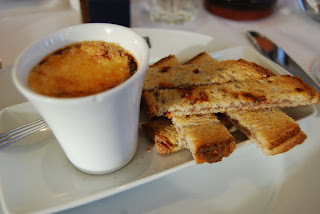 Parmesan custard with anchovy toast at Le Cafe Anglais was pretty special (haven't blogged that yet)....oh, the chicken liver and polenta dish at Pizza East was damn nice too. So there you have my take on the past year. I hope 'you', my readers have been entertained. I love reading your comments, so make sure to vent your spleen often.....I appreciate everything you have to say. (well.... almost everything). Here's to another year of Essex Eating stay tuned for more thrills, spills, bigger portions, heavier hangovers, excitement, death defying madness.......errr....... basically more of the same, just bigger and better. My Big Fat Christmas Eve Blowout. 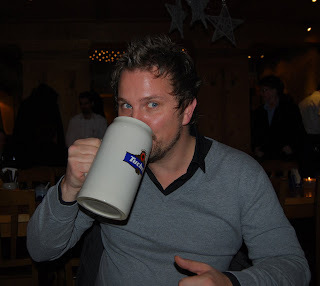 First of all - Happy New Year to you, readers of my blog. I hope this year is an excellent one for all (two) of you.....and, hello Mother. That out of the way, for my first post of 2010, lets talk about Christmas Eve 2009. Every Christmas Eve for the past few years, I host a big blowout around my place for mine and the GF's respective families. Lots of booze, lots of food and lots of dressed up to the nines, knee high, nieces and nephews (try saying that after a glass or two) running up and down the hall and absent mindedly trailing their sticky dirty hands along my oh so impractical white minimalist walls. I enjoy it immensely though. I love hosting a big family get together, and I love providing the food and drink. Even though, invariably the preparation, which takes all day - normally descends into chaos with time running out, sweating, swearing, tempers flaring.......I still enjoy it. Once its finally done, and I've had a drink or three. The families enjoy it too, otherwise they wouldn't keep coming back I guess. This year, I thought I'd try a few new things....mix it up a bit. The Coco book which I reviewed last year here, has a section on Lyndy Redding with some fantastic looking canape recipes, although these are completely untested by me (which isn't always the best idea when your under pressure to deliver, as Ive found to my cost at a few dinner parties.....Lemon and Orange tart - my nemesis...I'm thinking of you). But being awesomely stupid, I decided to try a few anyway, along with a few old favourites from previous years. Goats Cheese and Red Onion Toasts (The GF's contribution, and by far the most popular thing...much to my disgust). And the normal selection of Olives, Twiglets, kettle chips, couple of cheeses (which no one eats), crackers etc etc. Oh, and I also planned on making mulled wine, the scent is so evocative of Christmas....really makes the place smell fantastic and sets the mood. I'd seen a Rowley Leigh (of Le Cafe Anglais fame) recipe in ES magazine.....it looked suitably paint strippingly, alcoholic, exactly what I wanted. So, Christmas Eve found me working steadily in the kitchen,...I seemingly had loads of time, totally on the ball. I'd run down the shops earlier throwing on a jumble of clothes, the first things that came to hand....that suave Christmas eve host look, as I mingled dispensing canapes and witty comments? I looked like a particularly vile and repulsive tramp. Into this Maelstrom the GF had come home from work and attempted to help......by moaning that she didn't know what to wear....and stopping me mid panic, asking me to help her open a bottle of Champagne....(I almost lost it at that point - I really did). I don't know how.....but somehow, I pulled it out of the bag....I managed to throw on some suitably debonair hosting clothes....(smoking jacket, cravat and Pyjama bottoms 'a la' Hugh Hefner if you must ask). 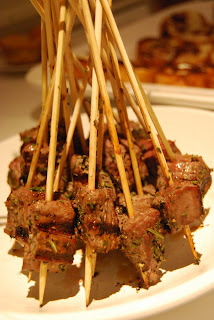 My last job was cooking the beef skewers on the griddle pan, and I made the mulled wine while my guests were arriving. Everyone was happy, my family was here.... it was Christmas Eve....the nieces and nephews were going nuts.....Sinatra and the Rat Pack were supplying suitably festive music.... the place smelt of cinnamon and cloves, Right there and then, I wouldn't have wanted to be anywhere else. 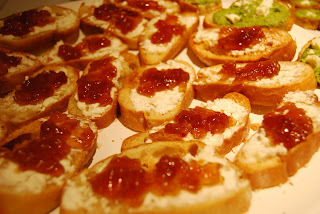 followed by the GF's goat cheese and onion relish toasts, which are always incredibly popular. 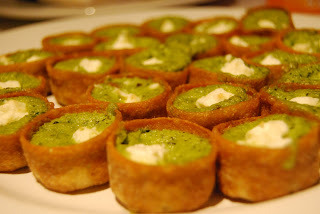 The Pea and Mint Feta tartlets - were ok.....I wouldn't make them again. 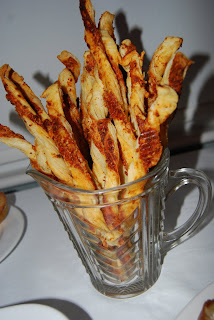 The Cheese Straws were bloody gorgeous.....I had to explain I'd actually made them, because everyone thought by the look of them, they'd been bought. Oh - the mulled wine went down very well.....I ended up drinking most of it myself, and was in quite a festive state. 12 slices toast, buttered one side. Couple of handfulls of grated Cheddar Cheese. 8 Slices of Bacon - fried. 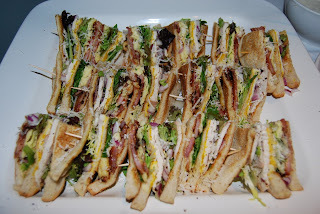 Cocktail sticks to hold the sandwiches together. Lay out four slices of toast, buttered side up and build the sandwich up - it's a triple decker deal. You can do this anyway you want, but I normally give it a squirt of Mayo, grated cheese, chopped onion, the bacon and some salad leaves....then the next piece of toast on.....a squirt of mustard, the Turkey or Chicken, more grated cheese and chopped onion, and more salad leaves. Finally the last piece of toast.....cut diagonally into four 'V's and put a cocktail stick through each. Arrange on a plate, and grind black pepper and grate Parmesan over the lot. Mix the flour and yeast in a bowl. Put the butter in a pan with 250ml of water and 1/2 tsp salt. Bring to the boil and immediately tip the yeast and flour into the boiling liquid, beat until smooth with a wooden spoon. 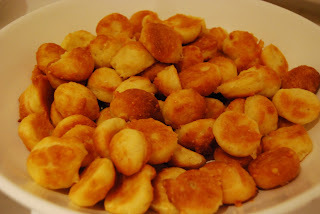 Line a baking sheet with non-stick parchment, and pipe or spoon little balls of the mixture, about the size of 50 pence pieces. Bake in the oven for 8-10 mins.